Eric Abraham is an artist who makes 3 dimensional drawings and ceramic sculpture. 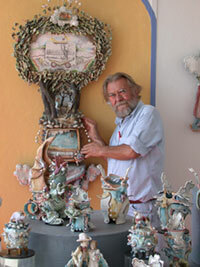 He currently lives in Lucas, Kansas in an old Chevrolet dealership where he has a studio and the Flying Pig Gallery. For many years Eric had a studio in Denver on Santa Fe Drive. Prior to that he taught at SummerVail Art Workshop and Kansas State University. He has an MFA from the University of Nebraska and BFA from the Kansas City Art Institute. Where we discuss the purpose of Art, today. Eric: That's hard to say. I can talk about the purpose of art in 1830. It was historical, to document. Since then, artists have been free to do whatever they want - Impressionists, Cubists. Their work doesn't look like real things you see. In 2011, art is going like Future Shock -- going fast. It's like computers. The minute you look at it - it's outdated. By the time it's in a museum or galleries, it's history. Because art doesn't have to record actual happenings - artists don't go out and draw an auto accident or the President giving a speech. Art doesn't have a function as it used to. It's free, but a lot of artists don't know what to do with this freedom. Like most freedoms. I think we do have a few anarchistic tenancies. Talty: Art is no longer about depicting real events, then what? Eric: I think artists are trying to depict something in their minds, in their imaginations. I rather use the word imagination because there are all kinds of stuff that occurs in the mind - insanity - but imagination indicates that you're thinking and you're evaluating, while things are going around in your mind but come out in your hands ... somehow. Talty: Do you mean you're translating the subconscious? Eric: I'd say there's some subconscious involved. When I'm working I usually don't do drawings with the clay work. I'll roll out some shape, or throw something, and the clay dictates to me what it wants to do. I did a series of cups last spring, and I turned them over and trimmed them, and they kept saying to me that they didn't want to turn the other way around. I made candleholders out of them. And that was a total surprise to me. Talty: You said that about a glaze accident on your Opera Goblet? Eric: I dipped in a red luster instead of the pink luster. Of course I didn't notice it until after they were fired. Talty: There's a separation between the designing and the result. Eric: This is the trouble I'm having with clay right now. You make the piece, it has to dry, go through the firing, build a whole kiln load, then you have to decorate it - that used to be a dirty word, when I was in school, then fired again, and then some of them have to be assembled and a several months have gone by. The pieces I'm working on now, in January, I did in October. I losing the thread of the idea. That's why I like the 3-dimentional drawings so much better. I do a small sketch and then start on the illustration board and it tells me sometimes that it wants to do something besides than what's in my drawing. As far as the function of art, it has many functions. It can go from outright illustration - the car accident - is the artist recording something in his life, or his subconscious or his imagination, or if it's non-objective, it the colors that he somehow has an affinity to. It's a recording of something that's personal to him or her. Talty: Do you think that's something that we're going to say later is a valid function of art? It's like a politician making a speech. He's ranting and raving. He doesn't talk like that normally. Last night the president, he was emphasizing and a emoting to make his points. Art is a special statement. Music, visual art, play acting - we had play acting before the Greeks and Romans - these are divorced from the world and make it special. Talty: Do you have any idea what this specialness is? Eric: Friends of mine have a painting done by an elephant. It's a nice non-objective painting because the elephant was trained to make a mark on paper. Some of our students are trained to make marks on paper. But, we can make a red mark on a piece of paper and say we don't like that red mark, we got to put some blue on it and make it purple, and no we don't like that and we're going to put some diagonal marks in yellow. And we consciously think that - sometimes it's not that obvious, it's a process- but we can evaluate what we do. I don't think the elephant does. We have communication with the piece. We can decide we don't like it or we're going to put it in the next Whitney Museum show. Talty: It's communicating, special communicating? Eric: Somehow. And of course the viewer has some responsibility to react to the piece. Come, and say, 'my 2-year old kid could do better than that.' But the 2-year old kid might not have learned to evaluate yet. Ruth's grandkid, she's three, she told her mother that these are the colors of the song I sang. She's evaluating. She sees the colors in the jar and see the colors of the song she sang. Talty: Can you be that specific about what you're doing? Eric: With the 3-dimentional drawings, sometimes I go through several drawings in my sketchbook, and sometimes they just won't resolve themselves. Talty: Are you conscious of why does it resolve? Eric: It just feels right. I've done a couple of drawings from one photograph. The first one resolved itself easily but the next one ... one of the vignettes I had was my father and I getting ready to fly a kite. And there up on the top ... I used a twisty for the tail, painted it. And it came together. Talty: Are you trying to bring these experience to life? Eric: These are snapshots. The pieces are fairly autobiographical, but I think enough people have similar experiences to relate to them. Most people have flown a kite, they had a daddy, they had a car. Talty: If they're successful, how do you know? Eric: Because I like them. Success ... if it goes beyond the original photograph, something that gives it an inner life. To listen to the whole interview, with more descriptions of Eric's work and progress and stories from his childhood, listen to UnsafeArt interview with Eric Abraham.